Living on the west coast of Vancouver Island offers so many opportunities to make captivating images of nature. It’s easy to wander along a beach or into the woods and see something different every time. In the photo above, the fog was slowly lifting and the sun lit up the scene in a way I just had to capture. Converting the image to monochrome evoked just the feel I was looking for. 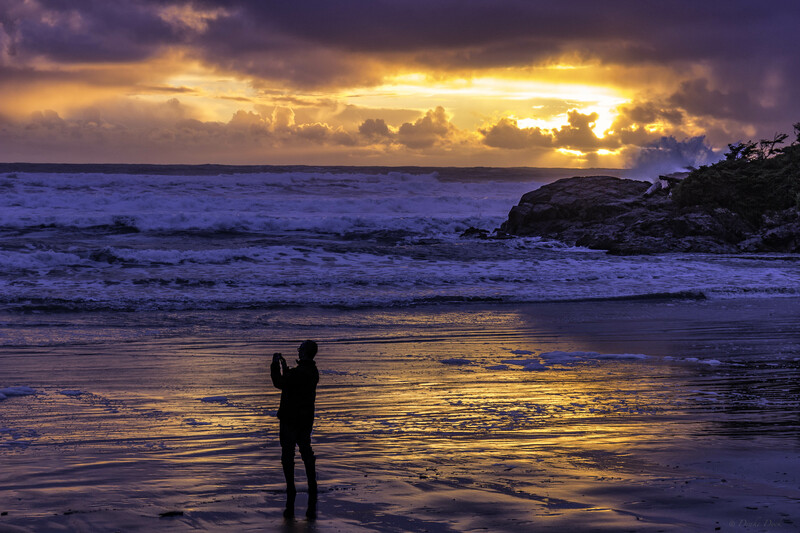 Sometimes you travel a little bit farther for something special, like the above image of a man taking a cellphone photo at sunset, on a beach in Tofino, BC (one of my favourite places to get away from it all). Just around the corner from me is tiny little Poirier Lake, which has trails around it and a little dock. I was lucky enough to visit it on one of those rare days when it had a little ice on it. Just next to the dock there were little groups of bubbles that had formed and I thought in this particular group of bubbles was particularly intriguing. 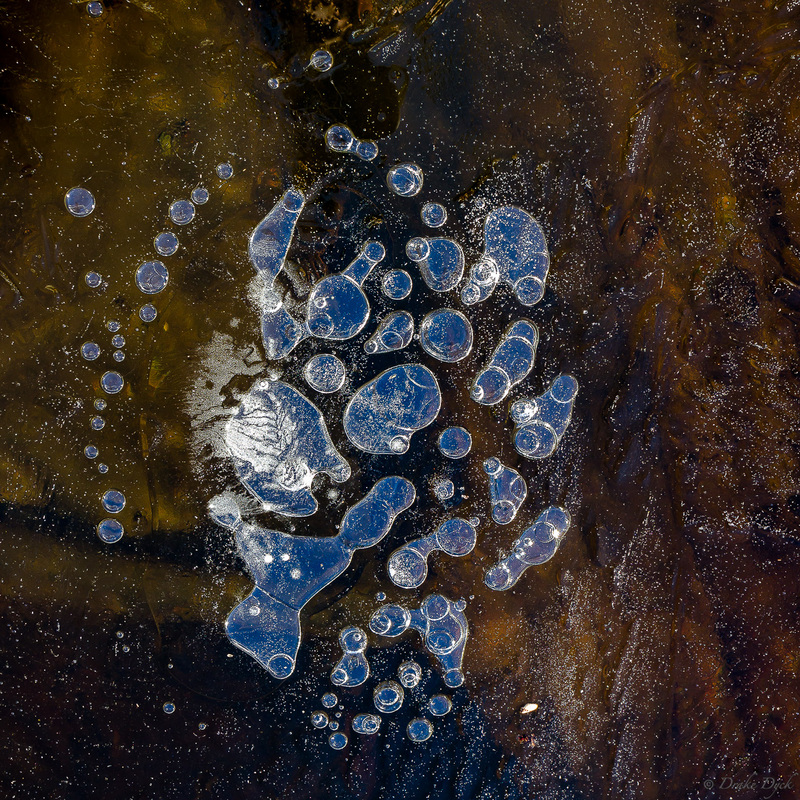 It seemed to hint at the shape of an animal paw/foot, and the fine powder on the bubble just left of centre had interesting patterns on it. It’s one of those things that if I hadn’t stopped to take a close look, I wouldn’t have seen and I doubt anyone else would, either, as the weather warmed up and the lake was ice free before sundown. Some of the images here made the list in part because I was trying out different techniques than I normally use, or just plain trying to be more creative. 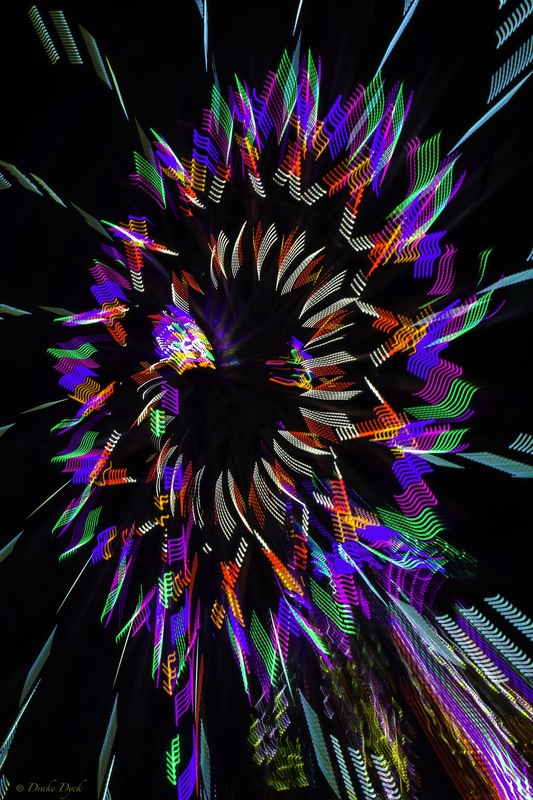 One of these is my image of the ferris wheel at the Luxton Fall Fair. I had tried a variety of different techniques to capture the motion of the rides and/or add some intentional camera motion and most of those images seemed pretty standard to me. This one I combined a couple things and loved the final result. Sometimes you just have to make images with the camera you have with you, such as the image above. 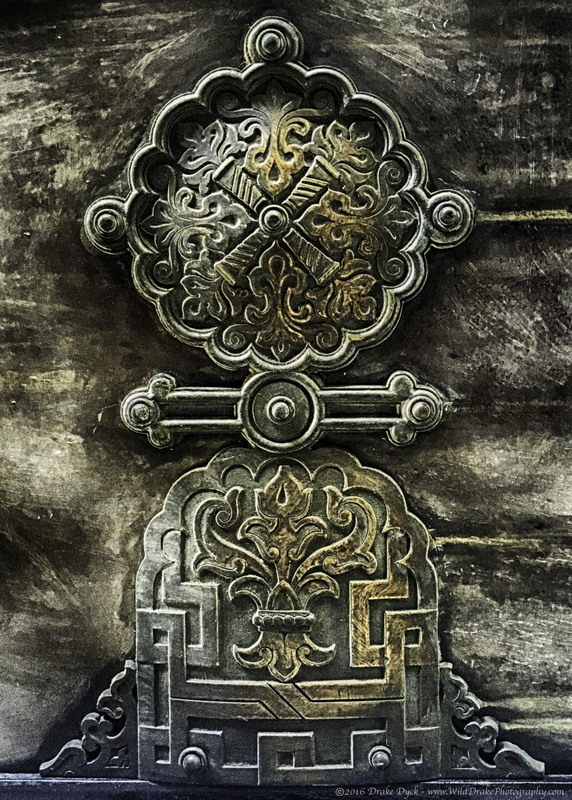 This is a detail shot of a brass door hinge (rotated 1/4 turn counter clockwise) on the Grand Mosque in Constanta, Romania. In this case, I was on a work assignment in the area and did not have my DSLR or any of my film cameras with me, but I am very happy with the results I was able to get using my iPhone. 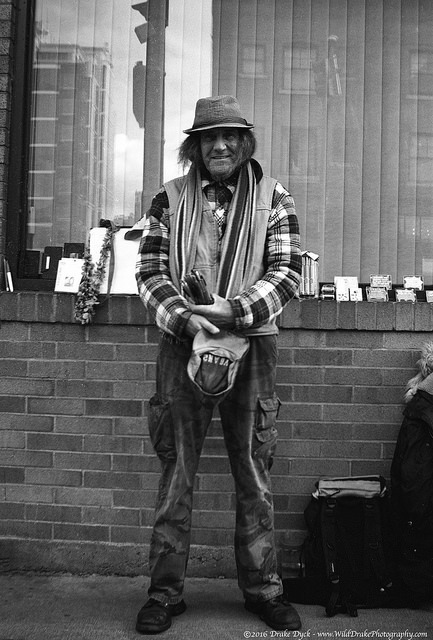 I am most comfortable making photographs of nature, landscapes, cityscapes, or even abstract subjects, so something like a street portrait was a bit of a stretch for me. The gentleman here was kind enough to pose for a photo I made using a century old Ensign camera and black and white film. Using the Ensign sparked the film bug in me and I have since blown the dust off my old Canon AE-1 and acquired a Hasselblad 500 EL/M. I am by no means abandoning using digital cameras, but going back to film and even getting back into film development has really got me excited and feeling inspired. I now have a dedicated film scanner and am looking at experimenting even more… keep watching this blog for more updates on these experiment. Having a satisfying experience with street photography, I continued to expand my comfort zone and when the opportunity came to make some family portraits, I was up to the challenge. 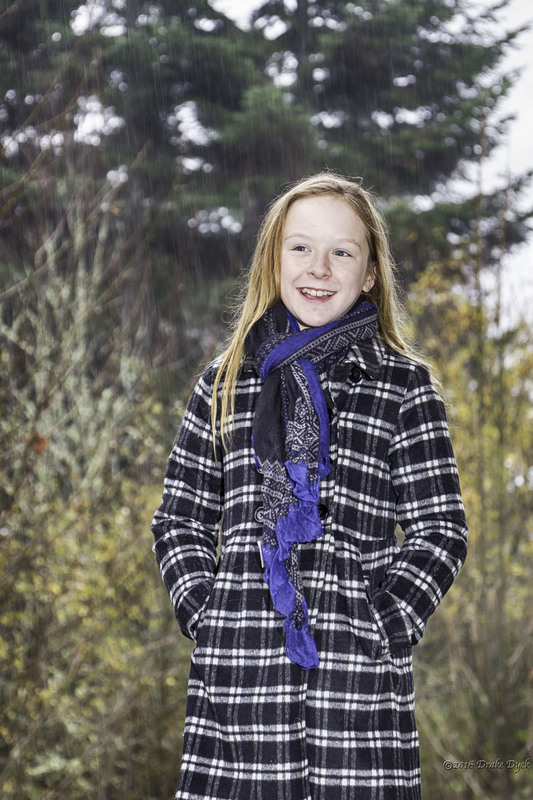 The weather on the day did not cooperate, but adjustments were made and I really enjoyed the photo session. In fact, the rain, lit by the fill flash, even added a distinct look to some of the images and gave them a more ‘authentic’ wet… I mean West Coast look. Every year, for the past several years, I have joined in the local area Kelby Photo Walk and always enjoy mingling with other photographers and strolling along for a few hours of photography fun. 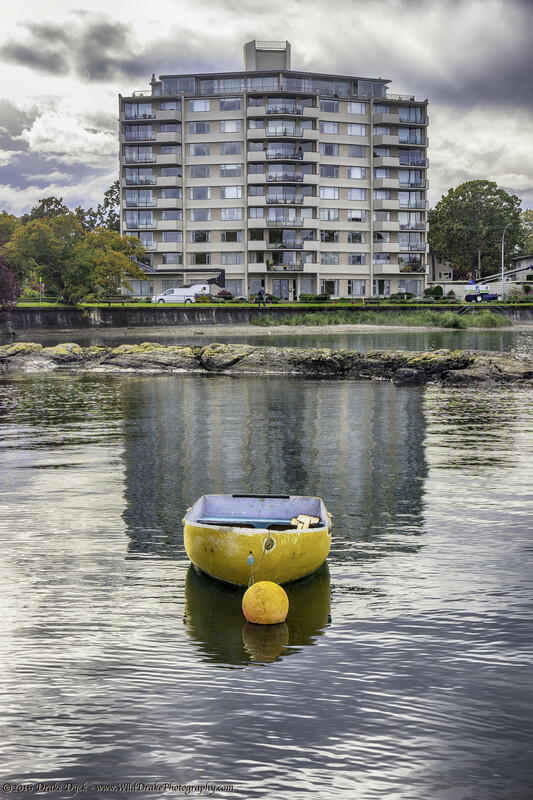 This year the one I participated in was in Oak Bay and I found this cute little yellow boat, gently floating on the water, which had tiny ripples on it, while there was an imposing concrete apartment building and dark foreboding clouds in the background… I loved the contrast. 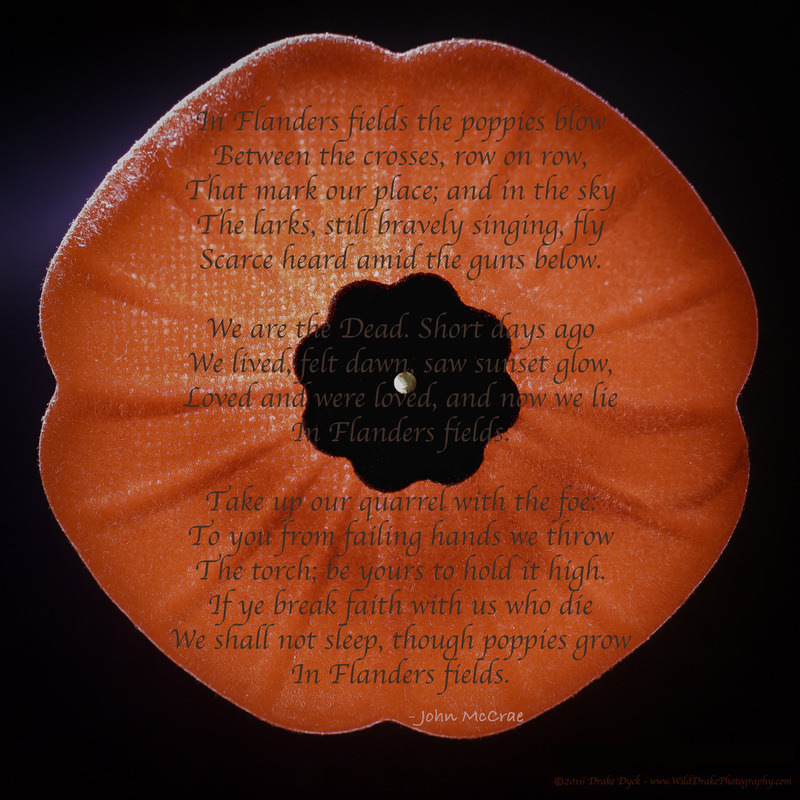 Remembrance Day has a very special meaning to me and I wanted to make an image that would be simple & respectful. I chose use the poppy we wear in Canada for Remembrance Day, against a dark background and tried to light it in a way to make it stand out. I almost never use text on any of my images; however, this was different and I chose a very special poem. Written by Canadian Lieutenant Colonel John McCrae while serving in the military as a doctor in Europe during WW I, In Flanders Fields has become synonymous with Remembrance Day ceremonies, and always makes me pause and reflect. 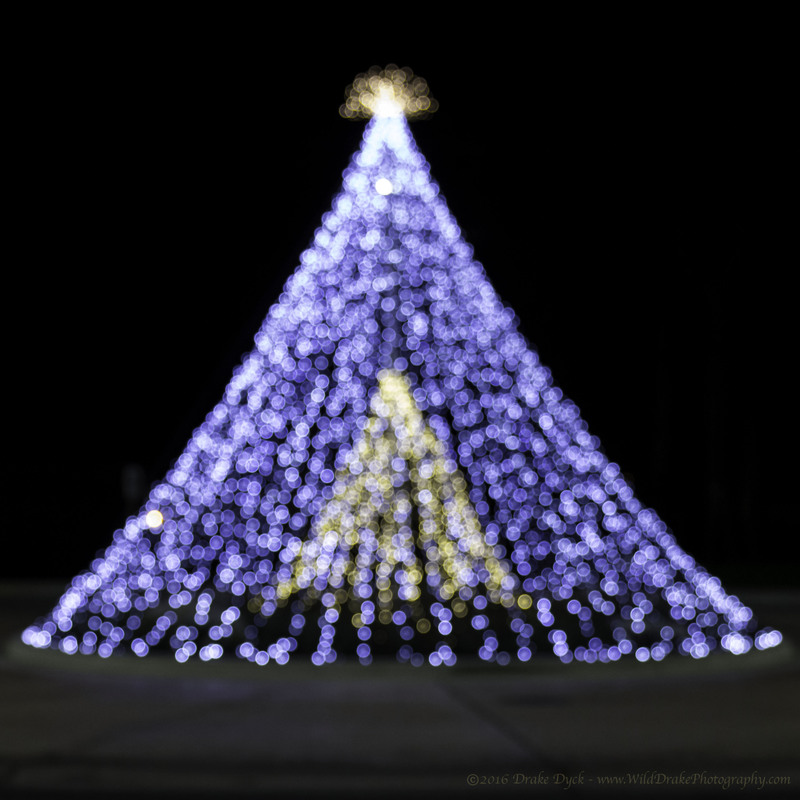 The year ended with my creative take on the “Lights of the Season“, which was the winning entry in a contest run by Oopoomoo (one of my favourite photography blog sites). I had fun putting this list together, but had a hard time getting down to the last ten, but that’s a good problem to have. I know this year the images covered a wide variety of photography genres and I am sure I will eventually have a more consistent type of image; however, it likely won’t be 2017, as I plan of doing a lot more experimenting and expanding my repertoire. At the eleventh hour of the eleventh day of the eleventh month. Please take the time for two minutes of silence and reflection.